You may not know it, but OS X’s Mail.app has the ability to utilize plugins. Installing a plugin is not an overly difficult task. After the first install, the subsequent plugins become easier to get running. A lot of the plugins you download claim that installation is as easy as double clicking on the .mailbundle file, but my experience shows that it just wasn’t that simple! Thankfully, the work-around is simple and straightforward. The first step is to navigate to your Home folder (command-shift-h) in the Finder. Open the Library folder and then open the Mail folder. Look for a “Bundles” folder. If it doesn’t exist, you should create it (command-shift-n). Now place a .mailbundle file in the directory. For an example, I suggest using letterbox. Letterbox will allow you to view your mail in a three column view. If you were using letterbox, the next time you fire up the Mail application you should see your inbox presented to you using three columns. Very cool. This didn’t work for me, but Dustin link worked like a charm. Thanks. Is there any site that aggregates all Mail.app plugins? Would be interesting to browse through. try http://tikouka.net/mailapp/ for a list of Mail.app plugins by OSX compatibility. Reminds me of the crappy outlook. letterbox seems to have disappeared. 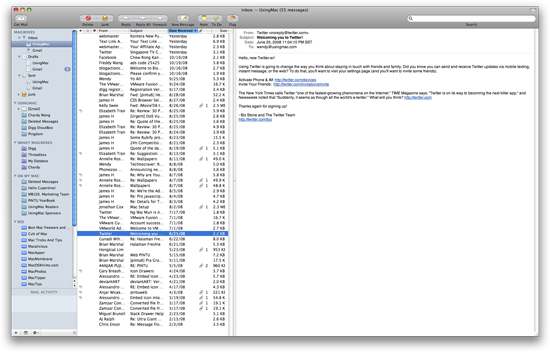 Just downloaded letterbox for osx 10.6.4 and its working. really nice!